Aloo Gosht: Aloo gosht is a meat curry in Pakistani and North Indian cuisine. 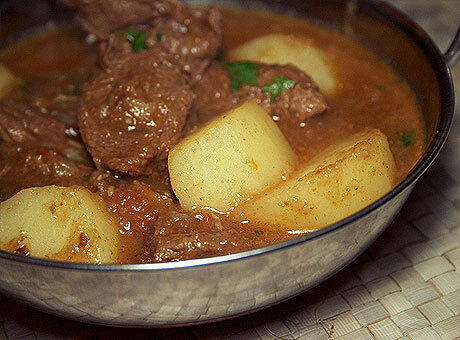 It consists of potatoes cooked with meat, usually lamb or mutton, in stew-like shorba gravy. It is a favourite and common dish in Pakistani meals and is commonly consumed as a comfort food. The dish can be served and eaten with plain rice or with bread such as roti, paratha or naan. Generally, the preparation method involves cooking lamb pieces over medium heat with various spices, simmered with potatoes. Place onions, mutton, cinnamon, black cardamoms, bay leaves, green chillies, 1/2 tsp turmeric powder, salt and 1 cup water in a pressure cooker. Cover and cook under pressure for 25-30 minutes or till 7-8 whistles. Heat mustard oil in a non-stick pan. Add in the ginger-garlic paste and tomato puree. Add in red chilli powder, coriander powder, 1/4 tsp turmeric powder and 1 tsp garam masala powder. Transfer mutton from pressure cooker into the pan. Add water as required and cook till the potatoes are done. Adjust salt; add remaining garam masala powder and mix. Aloo gosht is ready to be served. Transfer the aloo gosht into a serving bowl and serve hot with roti, paratha or naan. If you have any queries regarding the Aloo Gosht recipe, please leave a comment.